The LAPEL- 1 is hand made with high quality products to ensure long life and excellent recordings! 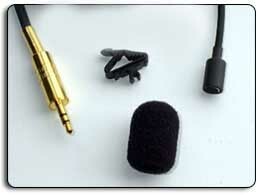 This microphone (very small in size) is a "mono" omni-directional microphone. Comes with a "SHURE" miniature wide mouth universal holding clip which attaches to the microphone cable for even greater flexibility! Premium windscreen included. -*** Must specify cable length, choice of 3,4,5,or 6 feet at no additional charge!! !